I am currently typing this post on my parents´ balcony in the sun. As I don´t have classes on Thursday and Friday this week (yep, not kidding! ), I decided to go home again for the weekend, enjoy the beautiful weather in the countryside and meet some friends as well. 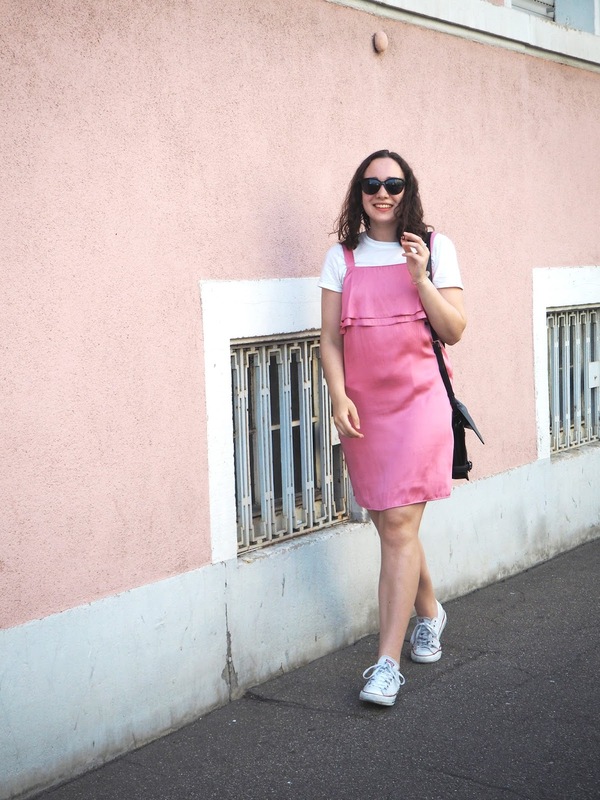 To round up my posts about Munich (see the first one here where I am talking about my fave 5 things to do in the city), I am showing you an outfit I wore for a touristy day in Munich - which included lots of walking. For a city trip, my priority is to pack good shoes - some in which I can walk in for an entire day without getting any blisters and ideally, also keep my feet dry in case of rain, all while still looking stylish. These Veja sneakers are the perfect companion as they tick all the aforementioned boxes. Since it was only 12 degrees warm (or rather cold?!) I went for lots of layers. The whole camisole-over-tshirt things has been here for a while, and I am really late to hop on that band-wagon, but adding another layer against the cold sounded way too tempting - and to be honest, I quite like the look of the striped shirt and black cami plus a blush pink bomberjacket. What do you think? By the way, I spotted this little field of tulips at the Old Botanical Garden more or less by accident and I had to do a little impromtu photo shoot there - and as I´ve ever since came across quite a few pictures taken here on Instagram, I am obviously not the only one who took advantage of this pretty location.